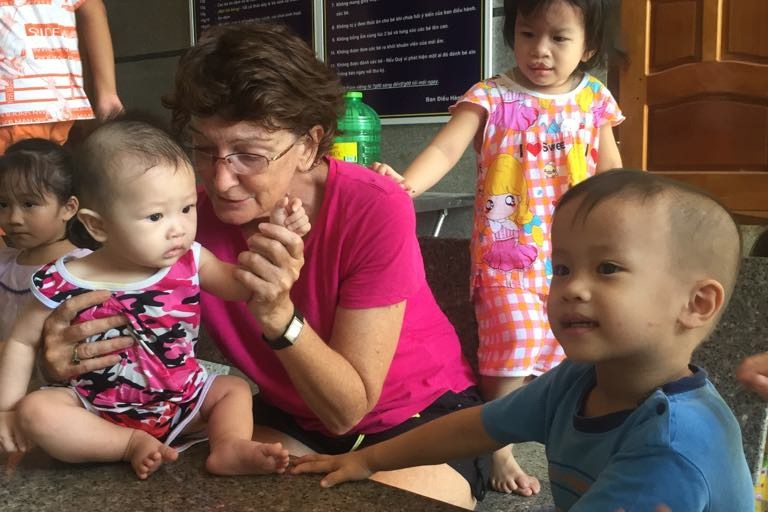 I am a 53 year old Australian who has been living in Vietnam for two years. 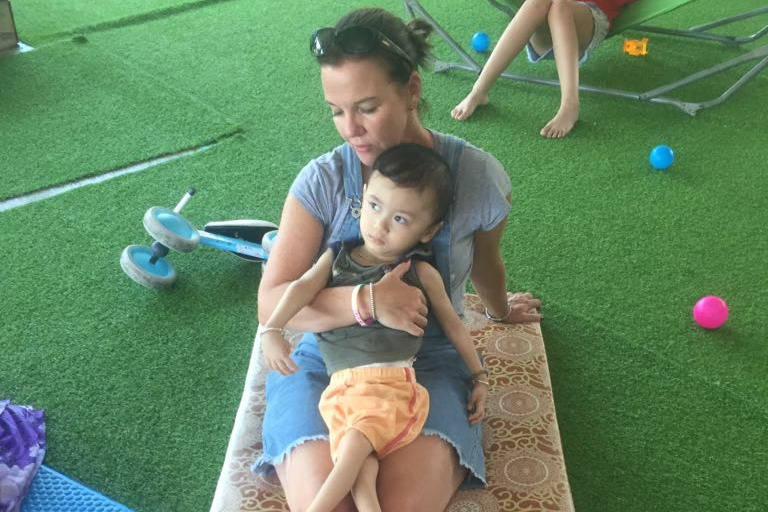 Through my business in Vietnam we do charity each month with a particular focus on feeding orphans. 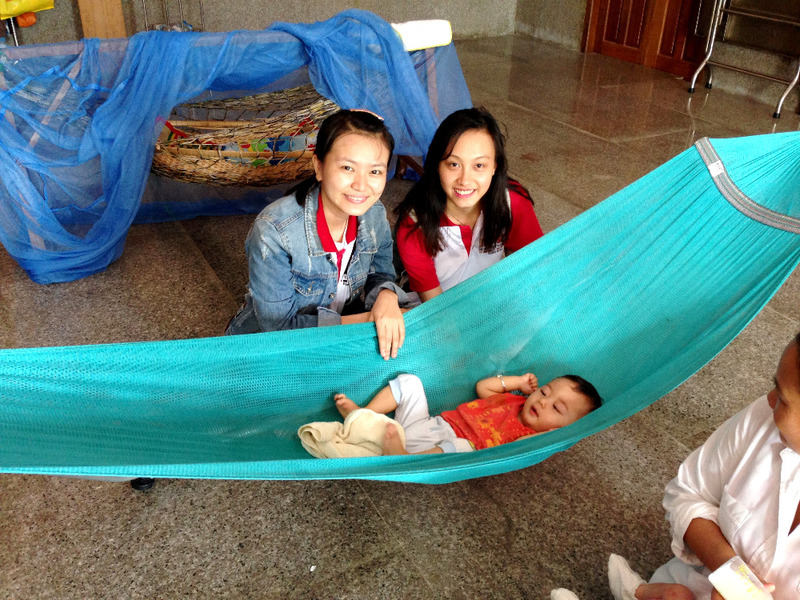 Tinh Xa Ngoc Van is a Vietnamese Budhist temple that has built an amazing orphanage for 200 children at Tu Bong. 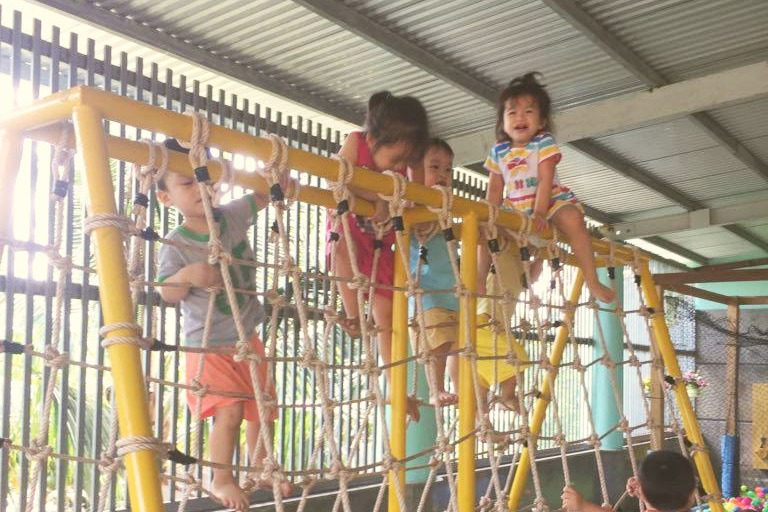 It has recently opened but needs funding to take care of the children. 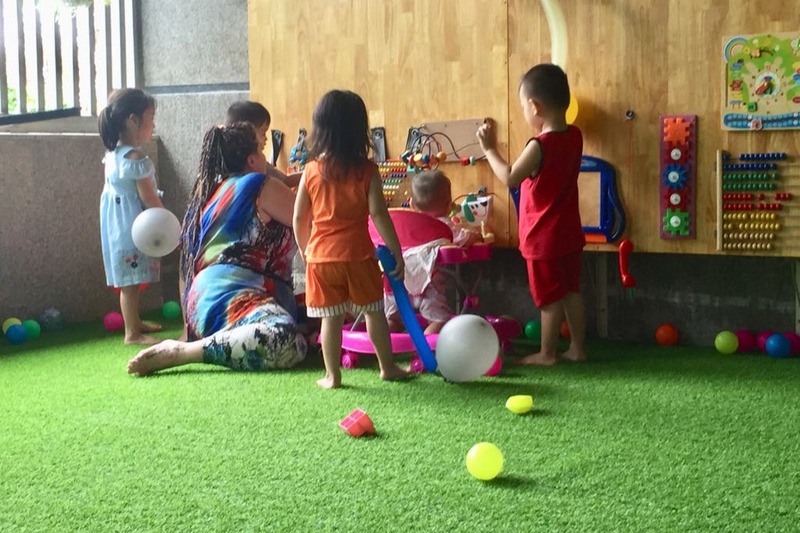 There is a vision of education (particularly English) for the future and for the local children but at the moment they desperately need formula, nappies and mainly carers for the babies. 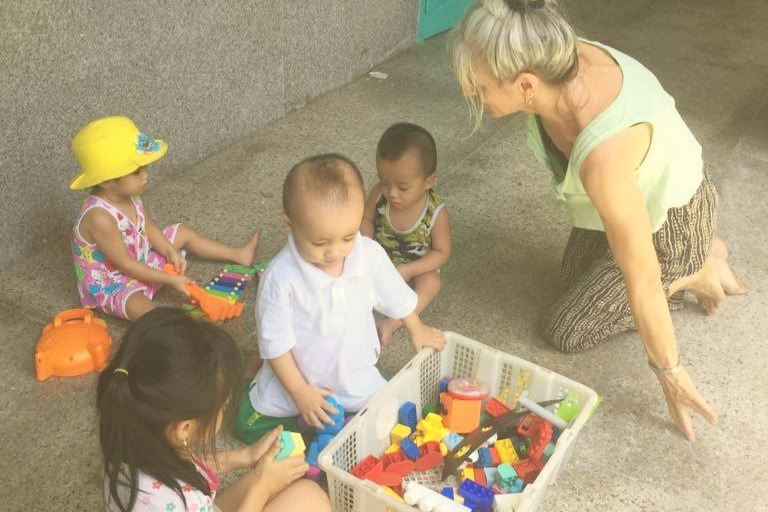 I have decided to come and live in the orphanage to help with the babies and to start teaching English to the monks and local children. Now they really need assistance, they are not getting a lot of funding and are struggling. They have nine babies at the moment. They just received two more last week. They range in age from 14 days old to 17 months old. They also have two four year old children and a 10 year old boy. Tai, Trung and Duc are the youngest babies. Tài, Trung và Đức là những em bé nhỏ nhất ở đây. Duc has just turned one month old and Tai is two weeks old. Đức vừa tròn một tháng tuổi và Tài được hai tuần tuổi. 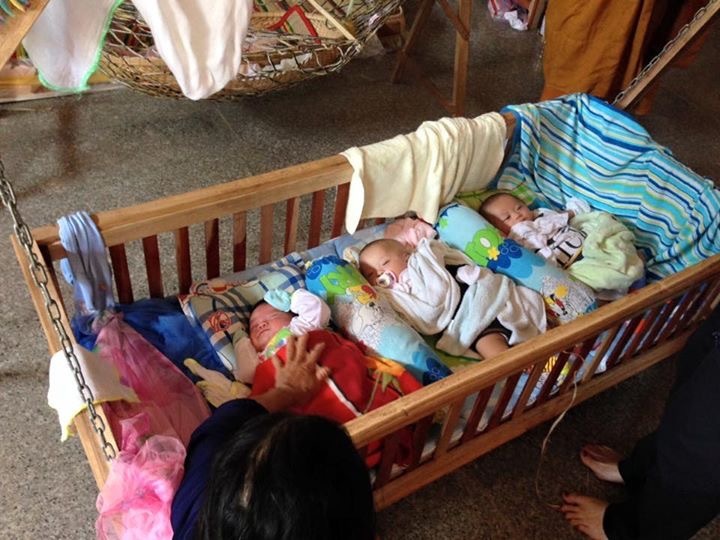 Nghia and Trung are four month old twins who were one day old when left at the temple. Nghĩa và Trung cặp sinh đôi được đưa vào chùa khi chỉ mới một ngày tuổi nay đã được bốn tháng. 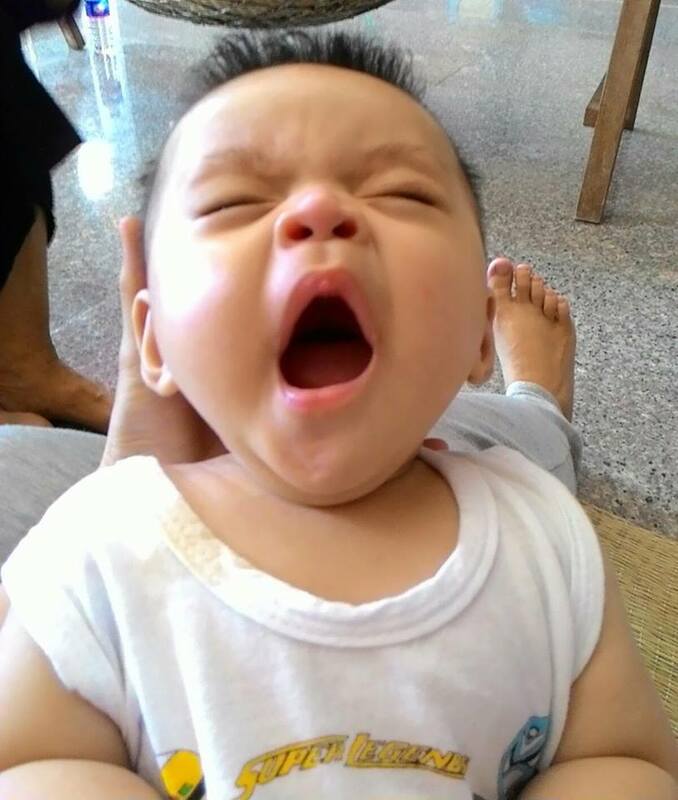 Hien is five months old. Hau is seven months old. 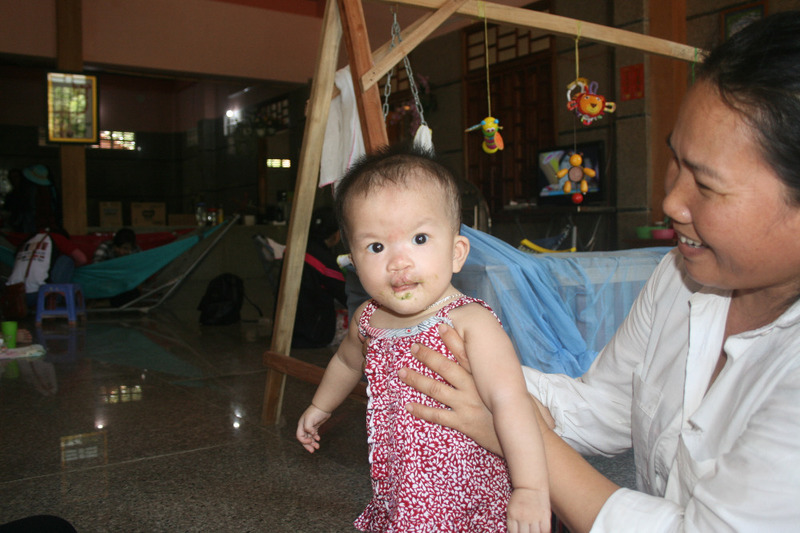 Hieu is the only girl and is eight months old. 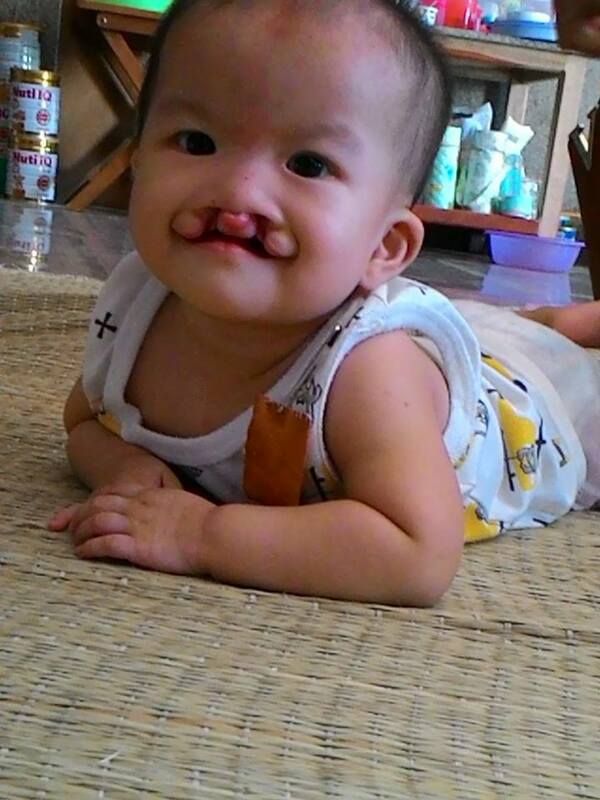 She has just had the first operation in the series to close her cleft palate. Hiếu tám tháng tuổi và là bé gái duy nhất vừa được phẩu thuật hàm ếch. 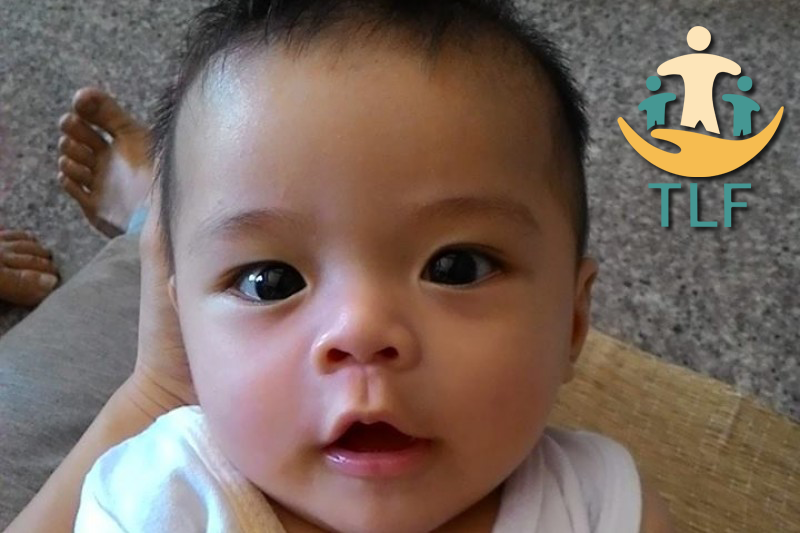 Phuc is seventeen months old and has mental and physical disabilities. 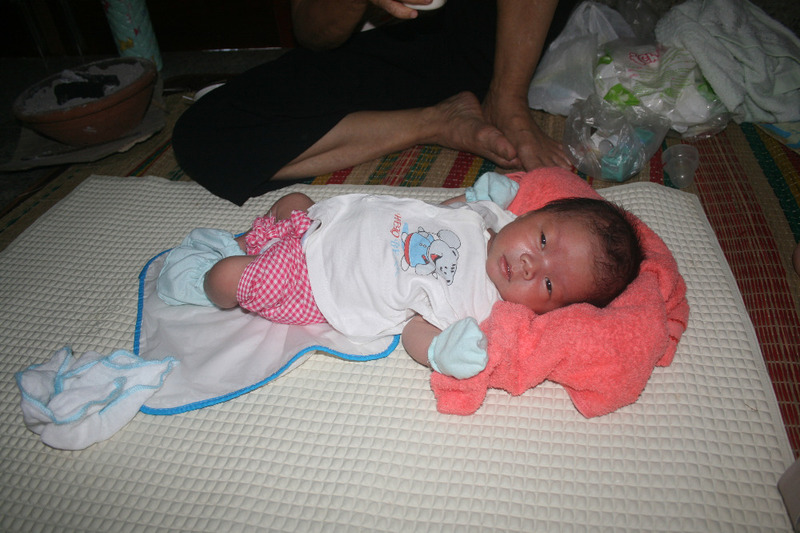 He is unable to crawl and lift his head. Phúc được tám tháng tuổi bị khuyết tật bẩm sinh, Phúc không thể tự bò và ngẩng đầu lên được. We need to raise funds so they can take care of the children. The carers that they have are a wonderful group of ladies who smile and laugh and love the babies. They have a genuine love for their job. There is a cost involved in having a go fund me page with a little under 10% of your donation going to go fund me. I will be updating pictures and stories as I go. Tôi năm nay 53 tuổi, tôi đến từ Úc và đã sống ở Việt Nam được 2 năm. Xuyên suốt quá trình kinh doanh ở Việt Nam mỗi tháng hai vợ chồng tôi đều làm từ thiện thông qua việc hỗ trợ cho trẻ mồ côi. vẫn chưa nhận được sự hỗ trợ nên thực sự rất khó khăn. Chúng tôi cần nhiều hơn những tấm lòng hảo tâm để chúng tôi có thể chăm sóc các em bé tốt hơn. các em. Các cô có tình yêu chân thành với công việc này. 3 000 000 VND ($185 Aus) tiền lương mỗi tháng cho người chăm sóc. 1 188 000 VND ($74 Aus) vật phẩm cần thiết cho những đứa bé dưới một tháng tuổi mỗi tháng. 737 500 VND ($46 Aus) vật phẩm cần thiết cho trẻ từ 6-12 tháng tuổi mỗi tháng. 470 000 VND ($ 29 Aus) vật phẩm cần thiết cho trẻ trên 12 tháng tuổi mỗi tháng. thông qua trang web này sẽ phải trừ đi 10% phí quản trị website, nơi tôi đang cập nhật tin tức từng ngày. Chúng tôi thật sự rất cần sự giúp đỡ của bạn. Tôi sẽ cập nhật sớm những câu chuyện và hình ảnh khi tôi ở đây. Cám ơn sự giúp đỡ của tất cả mọi người. I’ve just spent a fantastic 3 days at the orphanage just spending time with the children. It was a long weekend here so the children didn’t go to school on Monday giving us a bonus day. Juanita joined me for 2 of those days. We did drawing, read books played in the playground and had everyone joining in. The shyest of the children were out with everyone. We all went to bed each night exhausted but very happy. We practiced counting to 10 in English and Vietnamese. They are doing really well with this, singing lots of songs and starting to learn incy, wincy spider. They love the finger actions. Of course “Old MAC Donald had a farm” is still the firm favourite. I found lots of trucks, cars and bikes for them to play with and the girls got to play with dolls for a change. One of our carers has two children, a boy 11years old and a girl 6 years old, so I found some jigsaws for them to do and they had a great time. Very proud when they finished them. Thank you very much Juanita for joining me. 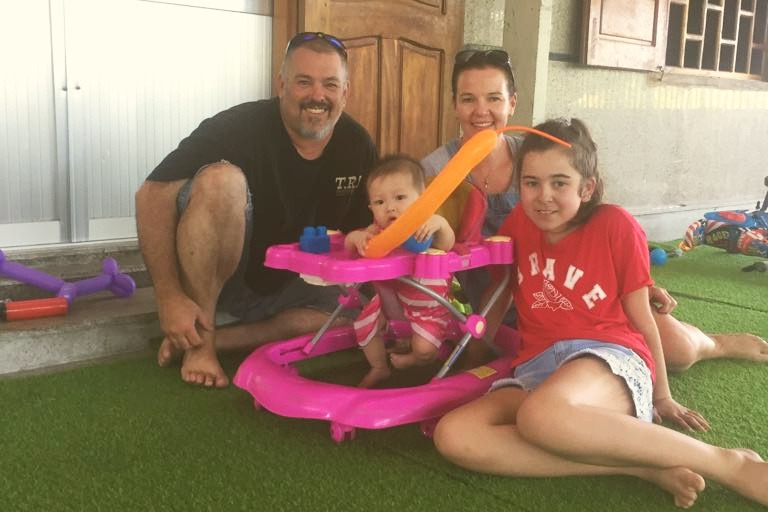 Rachel, Dave Fox and their 10 year old daughter, Mackenzie who are some lovely people from Melbourne visiting Vietnam, contacted me trough withlocals wanting to go up to the orphanage. We went up on Friday, when the older children were at kindergarten, so it was quieter but we still had a great day. 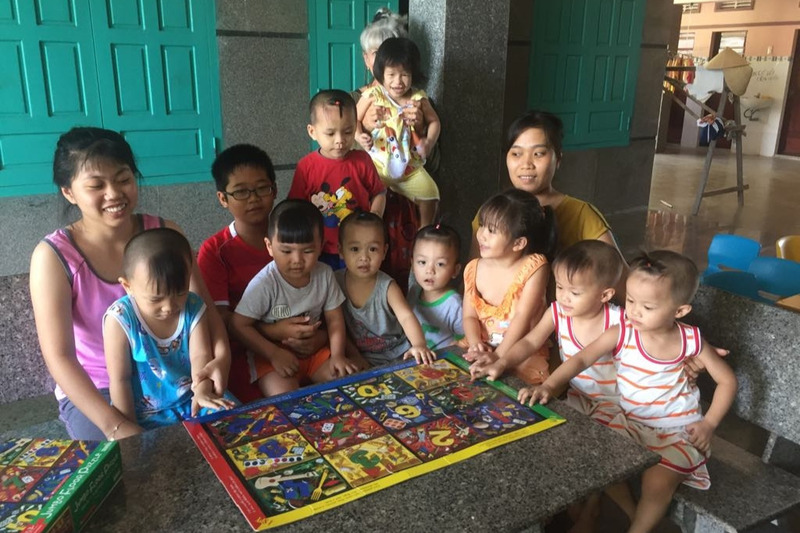 We got to spend time with Hoa, Tien, Thinh, Tam, Phuoc, Loc, Tho and Thanh as well as getting Phuc out for some sitting up and exercise. Dave had a beard so it took the children some time before they would go near him, but after we blew up some balloons they were playing well. 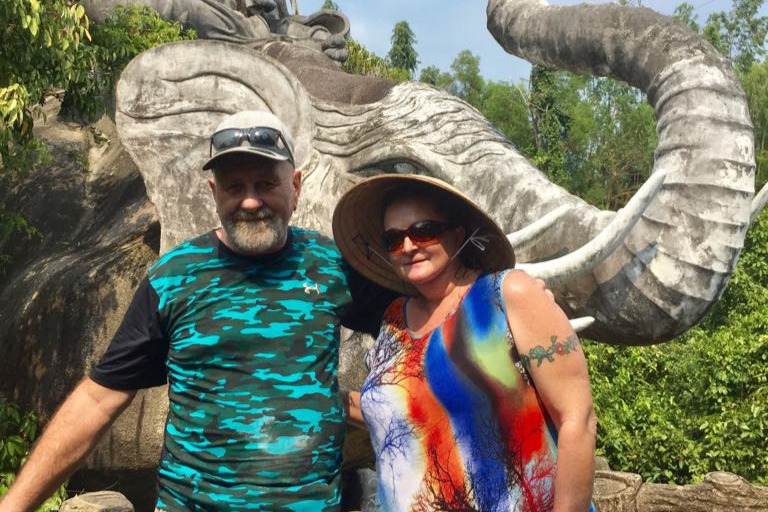 I took them up to the temple and down to the elephants for a walk. 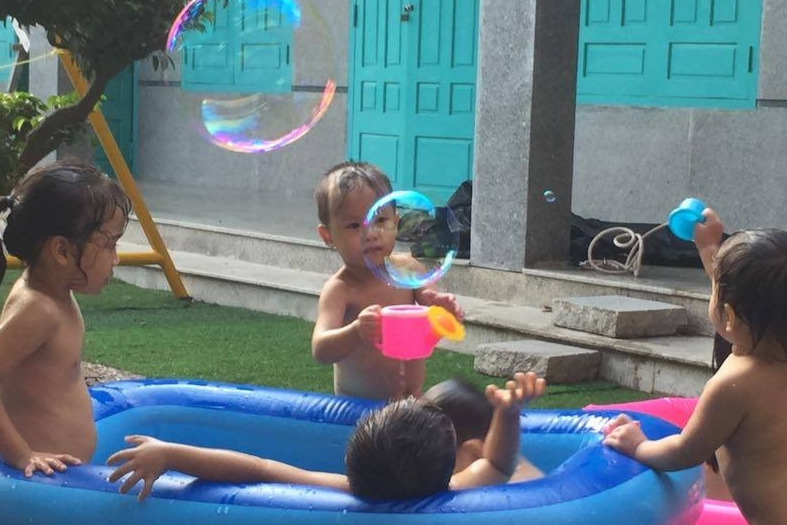 We had time in the afternoon to get some of the pools out and they had a little swim before we played with some bubbles and unfortunately had to return to Nha Trang. We had a fabulous time. Thank you very much Rachel, Dave and Mackenzie for coming up and hope you had a great time in Vietnam. It was Rachel and Mackenzie’s first overseas trip and hopefully they will be back. 2. Make a Donation – 100% of your generous donation goes to the children’s needs and every donation is accounted for on our facebook page through go fund me. Juanita and I went up to the orphanage for a few days. It was fantastic. We achieved so much. Put up the shade sails over the swings and slide with the help of Bao and Son, got to bring out the pools and had a fantastic time with so many of the children in the water. They were determined to make me as wet as they were. We had some bubble time after and they all got their hair washed before reluctantly getting dried and dressed. It has been so long since we have done this because of the weather and coughs and colds. We coloured in and read books before bedtime. Everyone was exhausted. 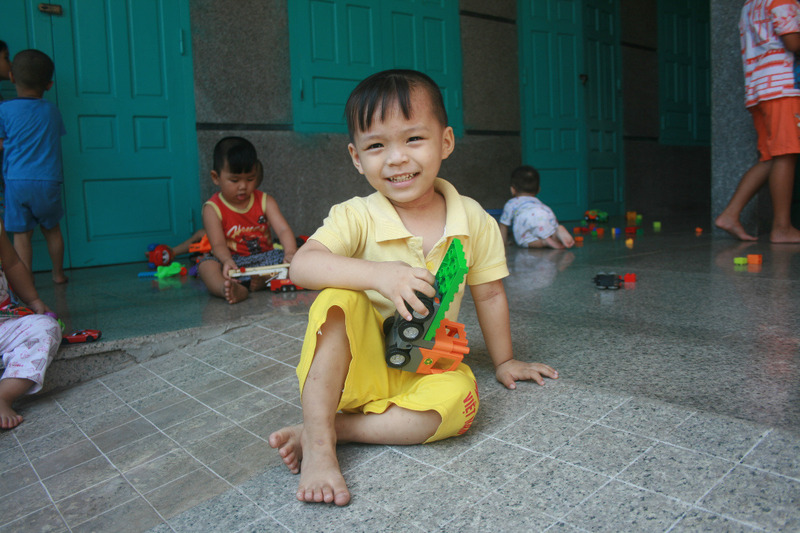 The next day Juanita and I got to spend time with the younger children and we did more bubbles and playtime with lots of fun and laughter. Thinh, Tho and Loc even came and joined in. They have been hanging back for some reason but were having a great time. Thank you very much Juanita for coming with me. 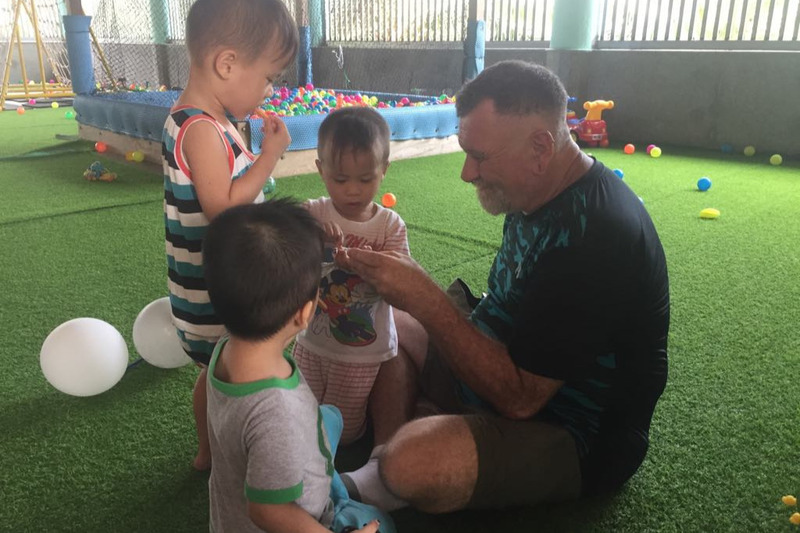 On Sunday I went to the orphanage with a lovely couple from Townsville, Australia. 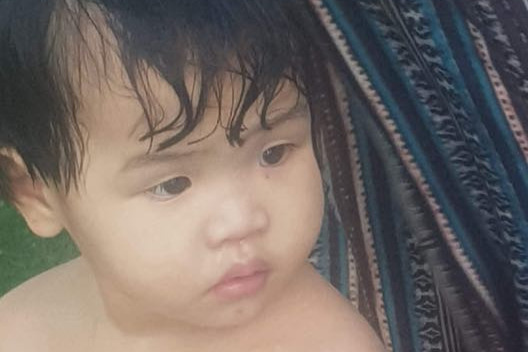 Steve and Coral-Lea are travelling south east Asia, it’s Coral-lea’s first time overseas. In Australia Coral-Lea works with children and was excited to come and help with ours. All the children were there because it was a Sunday and we were soon in the extension with them all playing in the ball pit and riding the bikes. Steve helped me fix one of the bikes that Hau showed me was broken. Hau was so funny he didn’t want anyone else to fix it but me, he kept pushing other people away who wanted to help. Duc and Hiển had Steve chasing them and soon all the children were laughing and running. We blew up some balloons and soon we were all having balloon fights and running around. Phuc came out for a cuddle and loved watching everyone playing. 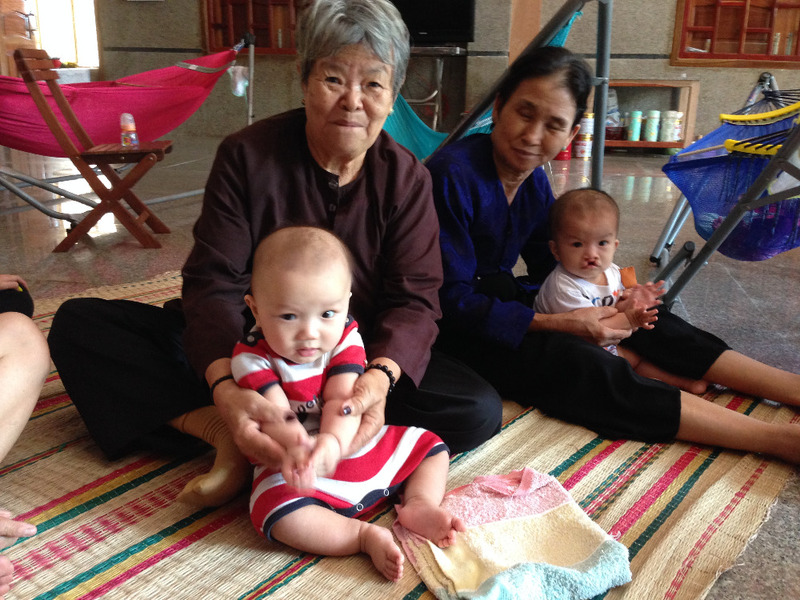 We had all the babies out, Hoa, Bao An and Tien were out there with us as well. After lunch we went for a walk and saw Dingo’s new puppies. She has them under a piece of granite. They are under a week old and still have their eyes closed. I have taken up dog biscuits so she doesn’t get so skinny. It was a wonderful day full of laughter. Thank you very much Steve and Coral-Lea for coming up. We hope to see you again. Hello, I would like to be there in person to help. How can I reach you in Viet Nam? Great Job on Phuc's splints !!! Hope this helps buy milk powder, nappies, and pay for carers to those little angels. Thank you Eileen for the beautiful day and your amazing work. I donated because I cannot be there in person to help. Thank you very much for your most generous and kind work. Glod bless. Mark was one of the Kyneton Rotary group that recently and had such a great experience. Merry Christmas! Merry Christmas to all the children and their carers.